This will be my first Campbeltown scotch! I am acting as a mule for this bottle and it belongs to @thewalkingdad as it is hard to come by in his neck of the woods. He allowed me to try it as a "logistics fee." The bottling date is July 20, 2018. There is also something written as 18/332. Not sure what that means. Fresh bottle, so I have allowed the glass to sit for 30min. Sample is neat first then with water added in a Glencairn. Nose: The smell fills the room sitting in the glass! Upon further examination...very maritime. Soy sauce, fish, wet wooden docks. Salty and tangy. Some citrus. Then sauteed mushroom and green onion served with baked oysters. Similar to Talisker in ways but more "deep." Nose w/water: The same maritime notes but less salt and more sweetness. I prefer the nose neat. Palate: The ocean is on fire. Salty, briney, and fishy up front then transitions to salty fruit and vanilla. Hot too. Palate w/water: Mmmmm...water settles the heat down and really opens up the palate. Same notes but easier to pinpoint and enjoy. Perhaps a tad sweeter and less salty with water. Nice. The palate is better with water. Finish: Tangy, citrus and brine. Lingers well. Water changes nothing here. Overall: I think this benefits from just a few drops of water to open up the palate. If Talisker distills the top of the sea, then Springbank distills the ocean floor. At $94USD+tax, I would pick up Talisker 10 or Laphroig 10CS at $70USD instead of this. But it is enjoyable and I'm glad to have finally tried a Campbeltown. @casualtorture 18/332 references to November 28th, 2018. This is usually, the bottling date. From my experience, Springbank 12 Cask Strength tend to get better with time as the fill level in the bottle drops. I wonder if the mania for the 12 year old cask strength has also, been coupled with a drop in it's quality. There was a time not to long ago when the bottles would linger on the store shelves for about a year. Now, it is very difficult to obtain in Canada and gone in days. 25 days ago 1Who liked this? @fiddich1980 Interesting. Then what is the 20.7.18 for then? I assumed that was the bottling date of July 20th. This is fairly availible here from what I can tell. Yes this seems like it would benefit from some air, unfortunately this bottle will be handed off to the owner for next week. I'm glad I got to try it before I got one myself. One of my favourite bottles that I've tried - and I'll soon be buying my third batch. Interesting that you didn't pick up any sherry type notes (I presume it's still 70% sherry casks, 30% Bourbon casks). This just ticks all the boxes for me - especially the musty, earthy, funky aspects to offset the sweet, fruity notes. Here the 12 CS is not much more than the 10 year old (NZD$110 vs. $90). I enjoy both but the CS is an easy winner in my book. 25 days ago 2Who liked this? I’m a big fan of this expression. I agree that most bottles get better the longer they sit, even with gas. This was certainly my experience with my first batch, in 2011, when as a novice I was not that enthused, but a year or so later it was a great whisky. I may not have been gassing regularly in those days. I don’t think my second bottle lasted quite a year, but was good from the get-go so it was probably my palate that matured. My current open bottle has maintained its quality for 1.5 years, mostly because I have so many open bottles. It used to be fairly available in Calgary for about $100, and some of the wine finished ones (like the amazing claretwood I stocked up on) were available for a few years. I think this year I may have seen the 15 and a few other Springbanks, but either I wasn’t looking for the 12CS because I have a spare, or they were pretty scarce. @casualtorture Springbank usually, releases two batch of 12 cask strength in a year. I wonder if the date code was a spare bottle from the 1st annual release and the written 18/332 is a correction? Maybe, just a quirk of the beverage industry. I’ma huge fan of this expression. It’s one of the 10 whiskies that makes my “Top 3” list. I haven’t tasted every batch though. 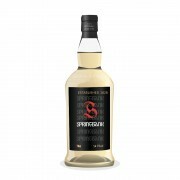 And I’ve found many Springbank expressions a little “tight and closed” when the bottle is first opened. 24 days ago 2Who liked this? @OdysseusUnbound Tight and closed would be a good descriptor. I'm sure the owner will allow me to try it again once it's had some air time. 24 days ago 1Who liked this? Air time is mandatory with this expression,, and anything SB really. I find it truly comes into it's own when around halfway through and about 6 months out from opening. Nice review of a HoF malt. Cheers!